The Immagica book blitz is on this week from February 1-7 hosted by Xpresso Book Tours. A great list of blogs have signed up for this event, and if you'd like to check out the list go here. Maybe you'll find another awesome blog you'd like to follow. Plus, each blog is giving away an eBook of Immagica, so make sure you enter for the chance to win. Throughout the blitz, each day I'll be posting something about Immagica. 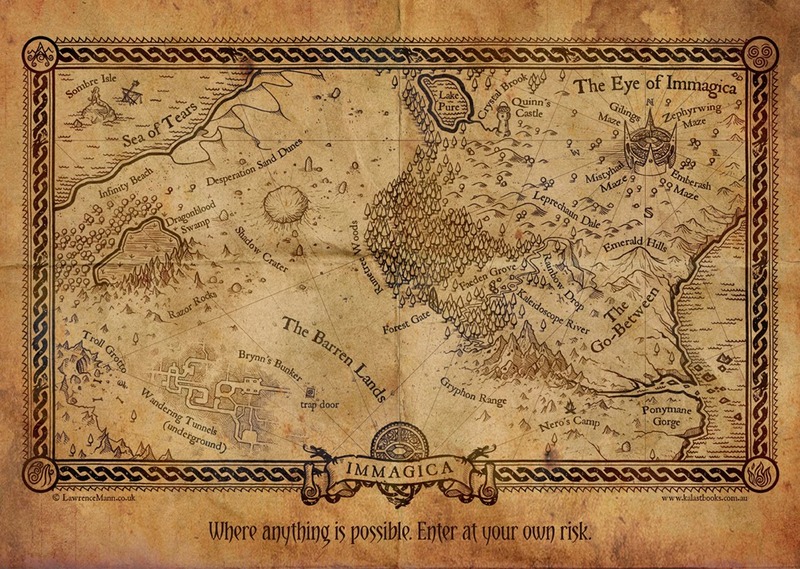 Today I'd like to share with you a post about how the magic within Immagica works. There are some excerpts at the end for you to read as well. Three lucky people will get a signed bookmark, postcard and fridge magnet. When we think about magic, we often visualise witches and wizards with wands, casting spells and striking people down with lightening. But the magic within Immagica is very different, and works in a non-traditional, magical way. The concept of Immagica is based on the power of imagination. Within our imagination, anything is possible. We can create whatever we want, and see it however we like, all inside our own mind. No wand or spell necessary. The land of Immagica is very organic. It can be shaped and tailored for whoever is there at any given time. There are, of course, certain things that remain the same, but everything else is open to interpretation, and governed by the imagination of the person experiencing the adventure. Like anything, there are certain rules, but some rules are made to be bent or broken. The magic of Immagica can be unpredictable, because Immagica itself is alive. It actually has a say in everything that is created, and the events that happen. It’s like having someone looking over your shoulder, nudging you in a certain—but not always right—direction. Imagination plays a major part in shaping Immagica, but the subconscious of the person visiting is also at play. There are two main sections of Immagica. If you have a look at the map below (click the image to enlarge it) you’ll see there’s the Barren Lands, which encompasses all the not so nice places, and there’s the Go-Between, which is a friendlier place, but not always. In the Barren Lands, the weather changes depending on your mood. Get angry and a thunderstorm can brew in a matter of seconds. In the Go-Between you have more control over things, but your emotions, subconscious and mind are all working either with or against each other. Although the concept of magic by imagination is a relatively simple one, it can sometimes get confusing in the way it works. This is mainly because nothing is set in stone, and something that happens one way for someone can work in a completely different way for someone else. Read these excerpts where Brynn attempts to explain to Rosaline the way Immagica works, and see if you can make sense of it. I think Rosaline had a hard time grasping the concept. Brynn got up and went to the other side of the room. From the shelf above the weapons she pulled down a piece of old yellowed paper, and a pencil. She sat back at the table and drew an image resembling the shape of the amulet. The eye was in the middle, and thick lines came out to form the compass points around it. She even included the intricate lines that lay between the eye and the edge of the circle. She then drew an uneven area around the completed compass, making it larger around the northern point. Beyond that, Brynn created another space that almost touched the edges of the paper. “Good. It doesn’t sound very nice,” I said. I ignored the snide comment. What she was telling me did sound pretty interesting, and despite myself, I leant closer to look at the crude map she’d drawn. The amulet map told me the maze was triangular—like a pie wedge—inserted between the south and east towers. I studied it closely until I thought I’d found the clear path through. It came out near the bridge just south of the Eye. Ira stopped at the entrance, stamped his hoof and tossed his head. The muscles in his shoulders tightened, and he snorted. I got the feeling he wasn’t too keen on the idea of heading into the maze. Hardly, Rosaline, I can look after myself. You, on the other hand, should be. You don’t know what we might encounter. I know what we could find, Ira said, but not what we will find. That is up to you. I twisted around to get a better look at her face. She raised her eyebrows and her pale blue eyes looked worried. “Immagica gives me what I wish for, but I have to be careful,” I said. “We can’t just think happy thoughts?” I asked. “You can, but it won’t help. It’s your subconscious you need to look out for. Immagica has a way of making you see things you may not want to.” I gave Brynn a worried look. “But I’m sure we’ll be fine,” she said. “No dreaming up the Minotaur then,” I said.